From AdAge by Nat Ives Published: April 28, 2008 Photo illustration: John Kuczala>>read more. 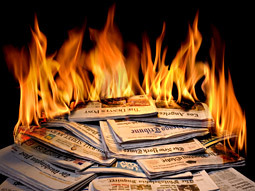 Newspapers’ overall ad revenue has been falling, down to $42.2 billion last year from $48.7 billion at the millennium. Tumultuous Week Highlights Industry’s Many Challenges NEW YORK (AdAge.com) — By now you know the story: The business of newspapers is in decline. It’s a terminal decline, if you believe experts such as Jeffrey Cole, director of the Center for the Digital Future at the University of Southern California at Annenberg. His research suggests traditional media in general must learn to shrink but newspapers in particular are a special case. “When an offline reader of a paper dies, he or she is not being replaced by a new reader,” he said. “How much time do they have? We think they have 20 to 25 years.” Of course, newspaper owners aren’t going to just give up and wait — and that’s why Ad Age is launching this series about the 1,437 dailies still working hard in the U.S. It’ll look at the thought leaders in the industry, their attempts to leave the past — and even formats — behind and their strategies for finding new business models. But let’s start with the industry’s travails, because the news last week was full of them. Tough Times The New York Times Co. elected its first outside directors since going public in 1967, capitulating to a pair of hedgefund shareholders demanding divestitures and a quicker turn toward digital. The first mass newsroom layoffs for its flagship paper bore down after buyouts found too few takers. And Moody’s Investors Service cut its ratings on the company two notches — to its lowest investment grade. Meanwhile, Rupert Murdoch neared a deal to buy Long Island’s Newsday from Tribune Co., a company that CEO and maybe-savior Sam Zell had said he could at least hold together. And Mr. Murdoch’s New York Post reduced its height by an inch and a half, following the Times and The Wall Street Journal and newspapers across the country in literally shrinking from costs. These were just the concrete results of trends that are gradually but relentlessly weakening newspapers as we know them. Trends such as the migration of classifieds, worth 40% of newspapers’ ad revenue as recently as 2000, to the internet, which better organizes and offers them to consumers. Last year classifieds mustered $14.2 billion for newspapers — which sounds like a lot until you see that’s 16.5% less than the year before. That’s according to statistics from an industry trade group, the Newspaper Association of America. Revenue down Newspapers’ overall ad revenue has been falling too, of course, to $42.2 billion last year from $48.7 billion at the millennium.